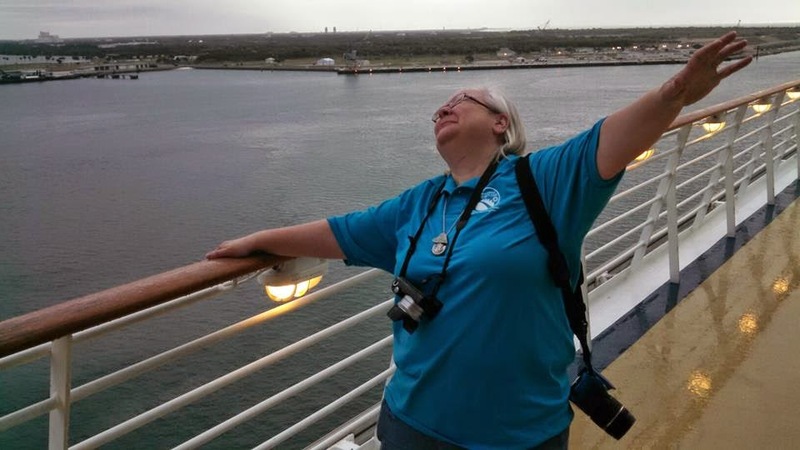 When the first Retreat & Refresh Stroke Camp cruise set sail in February 2012, I wasn’t sure what to expect in more ways than one. 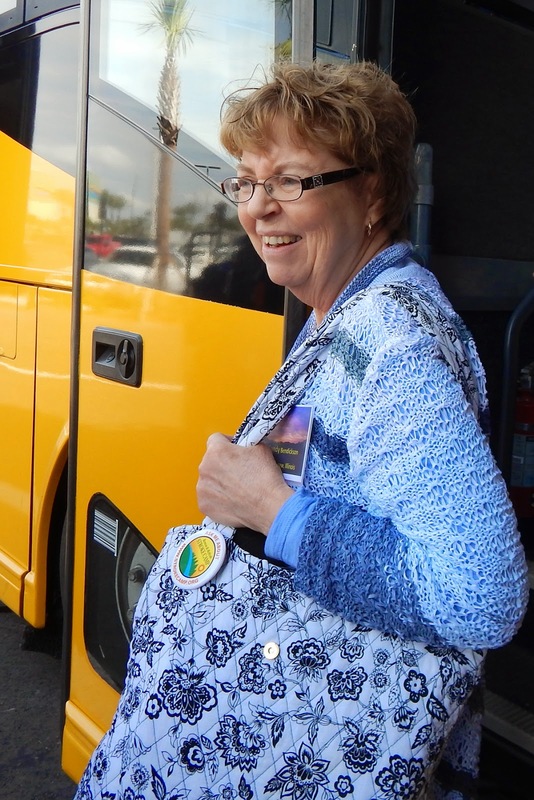 It was my very first cruise, and this was the first time 40-plus individuals from around the country who had attended Stroke Camp gathered in one location. It wasn’t a Stroke Camp: no drum circle, meal-time skits, support group sessions or Saturday night entertainment. 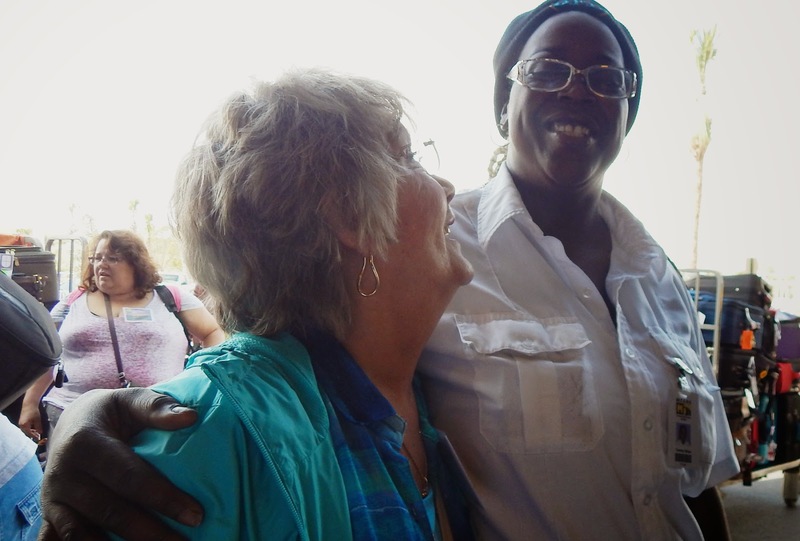 However, it had all the ingredients of what makes Stroke Camp so special: the people, friendship, laughter and love. Meeting new people and creating new memories together were hallmarks of this new adventure. 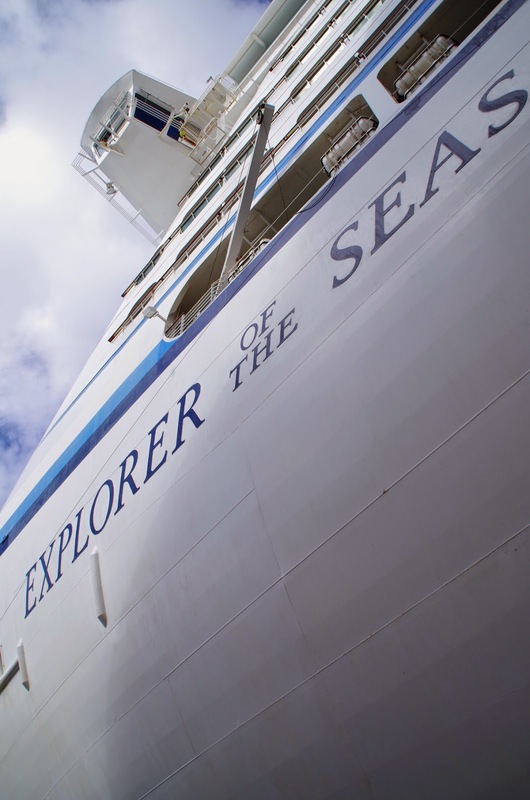 When a second cruise was announced for February 2015, my husband Roger and I were onboard immediately. 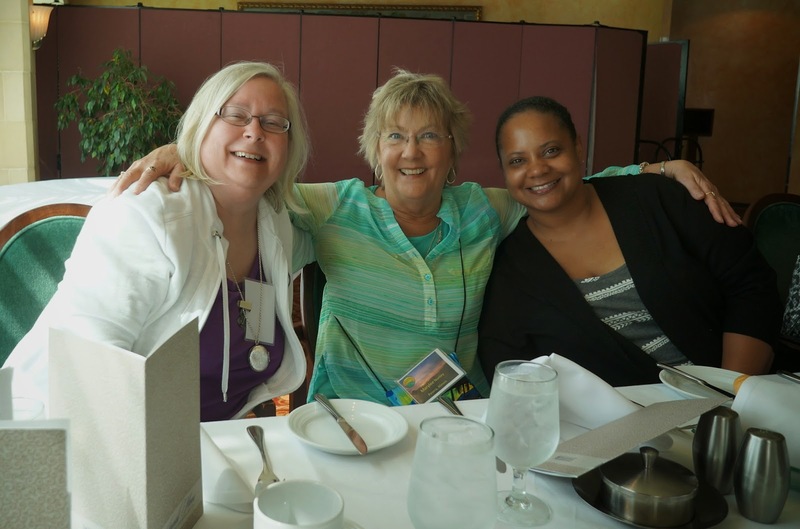 I have serious Stroke Camp withdrawal during the winter months, and I had to have my “fix” and see familiar faces and meet survivors and caregivers I hadn’t yet had the privilege to meet. It was a joy to be “crazy Monica” from camp, yet also be Monica on vacation. 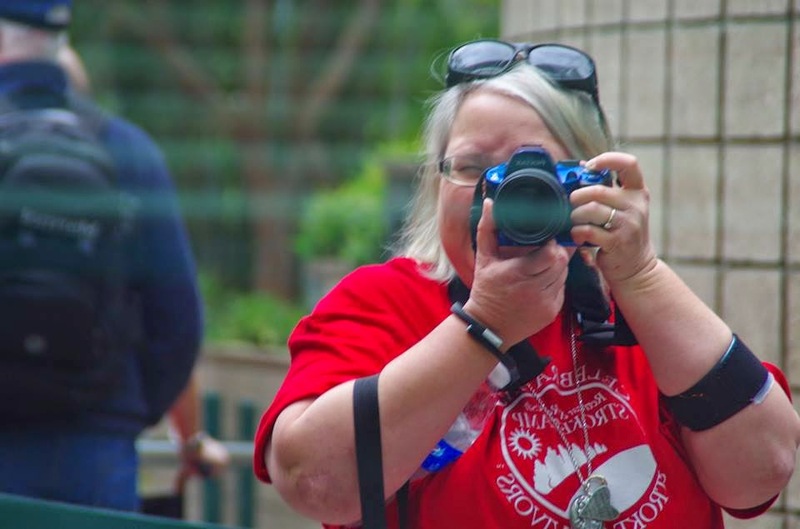 I had no Stroke Camp responsibilities — though I love performing those duties to help run a weekend camp. However, nothing keeps me from my camera, so my digital companion had no vacation. Gathering at the Orlando hotel the night before the cruise was truly like old home week, filled with hugs and reunions and introductions. It was just so much fun to talk and interact and laugh. I was quickly reminded that the people I see at camp were the same ones I was revisiting in the cruise setting, back in 2012 and this time around. We’re just ordinary people getting through life the best way we can. One of the major factors contributing to strokes is our diet. One of the results of a poor diet is an increase in cholesterol. High cholesterol content in the blood stream causes plaque to build up that will eventually block the blood flow through an artery. When that happens to an artery providing blood to the brain, brain cells begin to die at a rate of 1.9 million cells per minute until a stroke occurs. Because of this, some have gone to a vegetarian diet that is low in cholesterol. If you're on a vegetarian diet you will be familiar with the information below. 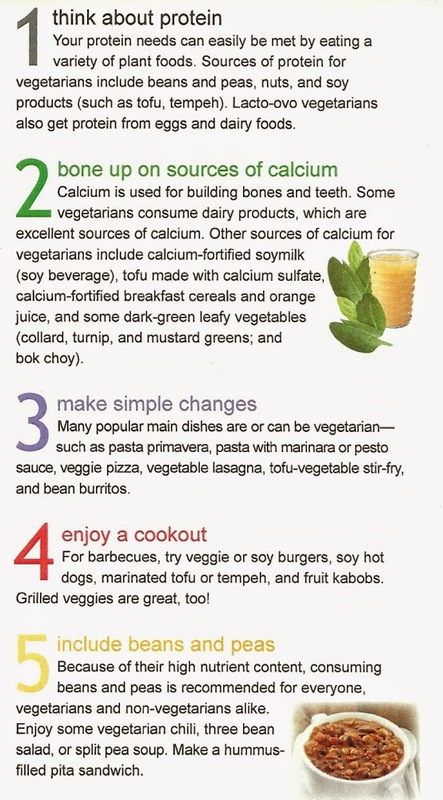 If you're not on a vegetarian diet the following will give you an idea of what one is and what vegetarians practice. I picked up the following handout while hosting a MegaBrain exhibit at a youth expo near Washington DC, and thought it was appropriate for you readers of this blog. 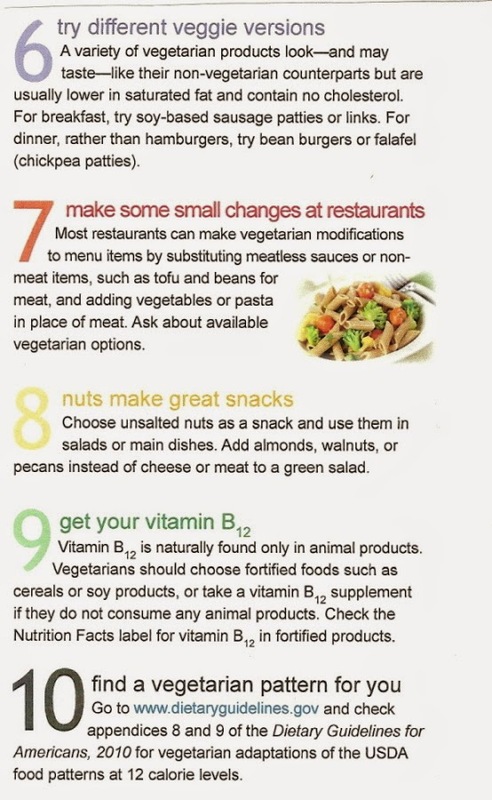 This handout was produced by the USDA Center for Nutrition Policy and Promotion. Go to www.ChooseMyPlate.gov and www.dietaryguidelines.gov for more information. I’m Not a Doctor I Don’t Need “Patience". Since this week's presenter is from Texas, I wanted to show the Strike Out Stroke video from the Texas Ranger SOS event but I don't have a 2014 video of that game. 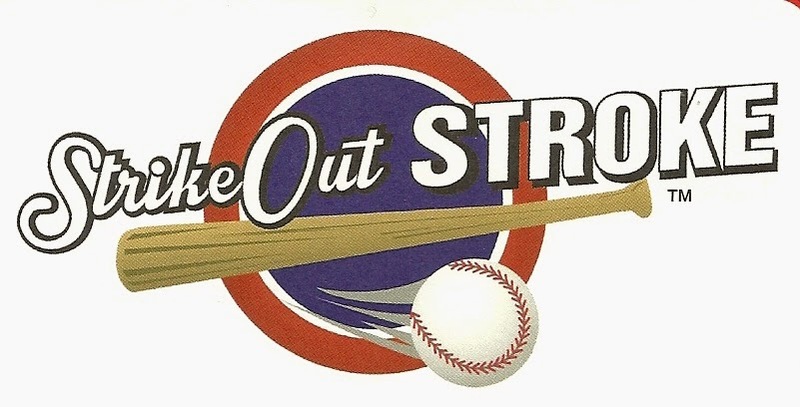 However, we will be having a Strike Out Stroke event at their 2015 game on May 13th and perhaps a video of that. If you are in that area, please attend the game that day as it will benefit both you and us. 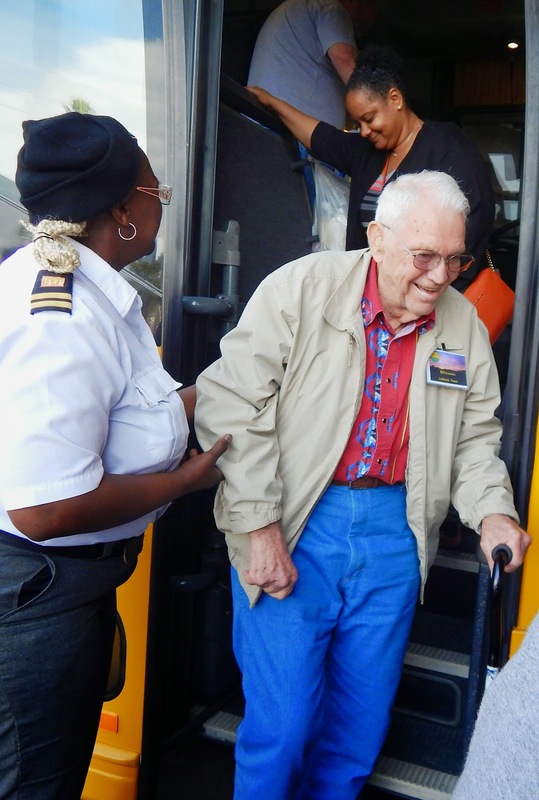 The following was contributed by Charles Smith a caregiver and Odessa, Texas, Retreat & Refresh Stroke Camper along with his survivor wife Nita. 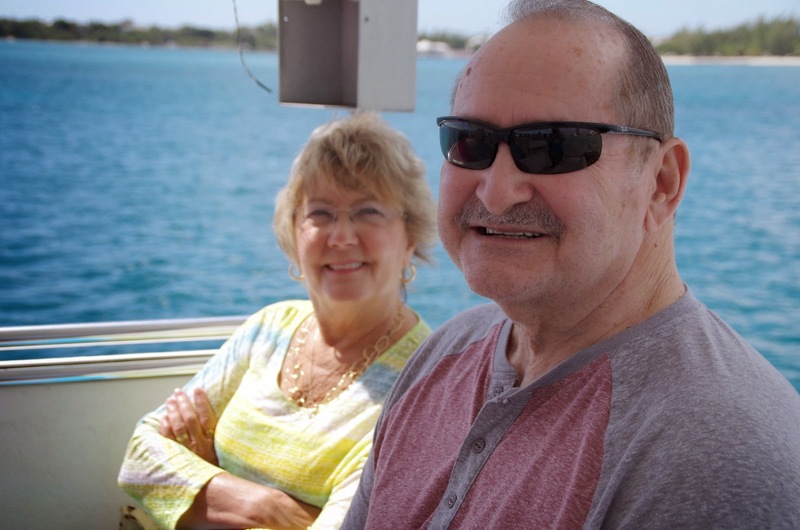 In this article Charles chronicles the events and daily life during the early recovery days of Nita's stroke and their "new normal". Well five years ago February 24, 2006, I had to change all of that kind of thinking and God gave me the patience I needed to get through a major crisis in my life. Nita had gotten her hormone shot that Friday morning and before the day was over she came down with an extremely bad headache. Over the weekend she appeared to have flu-like symptoms, something that was going around the Odessa area during that time of year. Little did we know that she had started suffering from a stroke. The following Monday she got in to the doctor and got treated for the flu. That afternoon she started slurring her words and we thought that was caused from the medicine she was taking. She still appeared to have the aches and pains associated with the flu. On Wednesday I was at work and my son stopped by the house and immediately seen a big change in her. She had forgotten things and was talking in meaningless jabber. 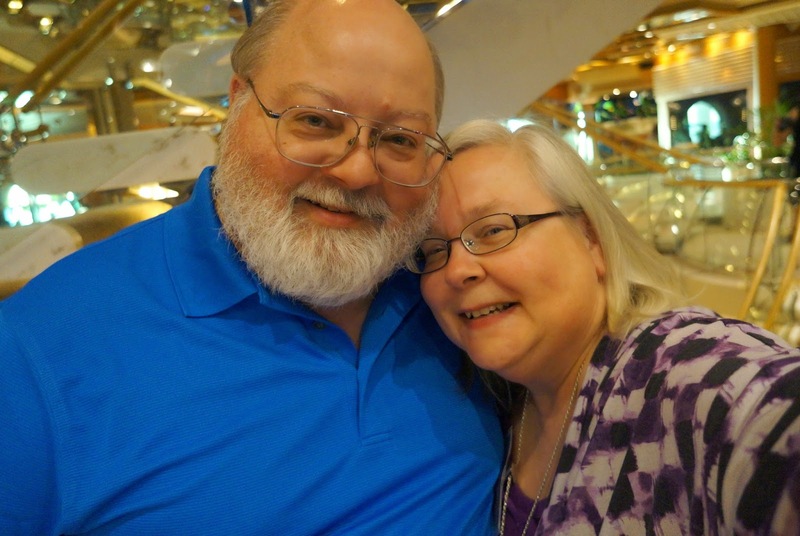 He got her to the Doctor’s office and they got her over to run MRI’s and other tests. I rushed from work to find her finishing up the tests. The X-rays and MRI’s showed that she had a stroke that went up both sides of the brain. She was started on medication to get the swelling down and the Doctor informed us that there was a chance that she might not ever remember things again and that she might not ever regain normal speech again. The medicine they put her on would bring down the swelling and we should see improvement. She did not remember anything for the next two weeks. She would get up each morning and shower and clean up and then most of the day she would lay in the bed. Each night I would tell her “Babe you’ve had a stroke.” The first night I told her that she told me without slurring her words she said plainly “It’ll be OK”. Nita's neurologist Dr. Abdul Kadir calls her his miracle patient. But I had to learn patience. February 24, 2006 our lives changed and at the time we did not know what the outcome would be. “Don’t leave me alone in the twilight” (“Twilight”a song sung by Rick Danko of the Band) “Twilight truly is the loneliest time of the day”. And I experienced that loneliness while you lay in the bed in such pain. I didn’t know what was going to happen to you. You had such a bad headache. I could not imagine life without you. I took a few days off from work. At night (twilight sometimes) I would sit at the computer and download music and every now and then I would look in to see if you were awake. I would stare at the walls a lot and wonder what I would do if you were not here with me. You would stay in the bed most of the time during the first several weeks. I would lie in bed with you at night and talk to you. You were hurting so bad with a headache and could not talk very plain. I told you that you had had a stroke. You looked at me and as plain as day you said “It’ll be OK”. I was there with you all the time that I could be. The kids (Michael, Melissa, Rubi and Kenneth) were there also and helped me very much from making sure that we made doctor’s appointments to whatever needed done. Your mom and dad and my mom and dad were there when we needed them. Doug (the neighbors on corner), brought over BBQ and boy was it good. Some of the people from church brought food. Wauneta Hoover brought a roast and you loved the gravy and potatoes. Mom brought a stew. We had a lot of food. Mom and dad came over and had supper with us. You tried to say something and slurred your words. It upset my dad, he got up from the supper table and went outside. You watched him leave and said “Mister, is he OK? Do I need to go see about him?” you always want to try to help. You knew that he had a problem choking. You always wanted to help even when you were hurting yourself and you always thought of others first. We would sit at the table and try to get you to eat. It was sometimes hard to figure out what you were saying that you wanted to try to eat. You did not eat much and you would smell of your food before you would eat it. When we tried to give you your medicine, you always wanted to know what it was and why you had to take it. At night before I went to bed, I would sat at the computer and listen to music. I would download songs and play them for you. You would be in our bed listening. You seemed to like listening to music. You would say things like “who is that singing?” and “I think I remember that song”. Sunday morning one week later you balanced the check book and seen where I had written a check for the house insurance. You ask me why I had written it. It was kinda like you were upset that I wrote a check and paid it. You said “there’s money talk to the lady” I had no idea what you were talking about. You had saved money for things like house insurance and other emergencies. I did not know where you had it hid. Our first time we went to Wal-Mart and you looked around the store and said “wow they got a lot of stuff here”. As we walked down the main isle looking for whatever that we needed, you would point and say “bottom right shelf” and there would be the item that we needed. You seemed to remembered where things were. You missed two hockey games and we went to the Tuesday game as we were going in you said “do you have the keys?” I said what for and you said “so we can get in the game”. I said “you mean our tickets?” You said yes. You carried a pillow in to hug on. Melissa was helping clean our house and had mentioned that she didn’t like your vacuum cleaner and that we needed to get a new one. You told her “ask the lady, the lady knows” you said “there’s one in the closet. Talk to the lady” We found a new vacuum cleaner in a box in the hall closet. One afternoon, Melissa got home and when she was entering the house yelled “Hey LADY, I’m home”. She would always say “Hey LADY” when she would come in the house. It dawned on me that when you were telling us to “talk to the LADY the LADY Knows”, that YOU WERE THE LADY. As you started coming out of your sleep stage, You came back to me and in a very special way. Thank you. You were just like a young child (around 2 or 3 years old). Everything was new to you and every thing you said was so innocent. It reminds me of what the bible says about “except ye become as little children ye cannot enter the kingdom of heaven”. I told you your favorite group was Jethro Tull, you said “It is?” And laughing you said “No that’s your group”. You knew I was teasing you. We would laugh a lot and cry a lot. We had to help you learn what things are. You studied while we sit out on the porch. Michael and Melissa build us a railing around the front porch. We sit out there when the weather is nice. Once you ask me a question about what you were studying and I answered you and you looked up at me and said “you’re so smart”. (it was something easy) You learned something new every day. The day after Melissa’s Birthday Rubi came over and started working with you and teaching you the ABC’s and how to count. Rubi would stay with you most of the day. She was very good teaching you things. Kenneth would help teach you things too. He would say Ganny that’s right when you would answer something. We went to Old Sorehead Trade Days one weekend. The drive over there scared you riding in the truck. Everything was new to you. You walked around staring at stuff and trying to remember what things were. I would take you out behind Family Dollar and teach you how to drive the truck. You said “can I go down this road?” and we ended up driving out around by the Rexene Plant. You passed the curve in the road and said “hey isn’t this where we shot fireworks with Leo Cloud?” (That was way back when the kids were little and you remembered that). The next time we drove I let you drive to the service road and to Love’s Truck Stop. You wanted to get out of the truck with it in drive and still running. I came home one day and you had been digging in the kitchen cabinets to see what was in them. You told me you found some wooden things and you started describing them with your hands. (They were clothes pins) You said as you pinched your fingers together “boy they’ll hurt you too!” I ask you what they were called and you did not know. I ask you what you used them for. You said oh they were Clothes Hangers. You were close. We lost my cousin Curtis the day Mom went to Dallas to the hospital. Memorial Day weekend we went to see her. You helped feed mom while we were in the recovery room. Sunday when we were getting ready to come home we went to trader’s village and looked around. You lost so much weight you needed a belt to hold your pants up. You wouldn’t let me buy you one so we found a strap and you used it for a belt. Then we went to Cabela’s and you looked at all the stuffed animals and read the names. You liked that store. While we were driving north bound on I-35 a car in front of us pulled over to the right like he was going to get off on the off-ramp and then suddenly he swerved back into the lane we were in. You said “that dingle-berry almost got us”. I said where did that word come from? You said “is it a bad word? It just came out.” We both laughed. I didn’t think we would ever be going to Colorado again. One day (June 2006 a week before we normally go on vacation) you looked outside the kitchen window and said “are we going to take that on a trip this year?” I said “take what”. You said “the trailer”. I said where would we take it? “To Colorado.” Well if you think you would like to try to go there, then I will setup vacation. We spent three weeks at our old camping spot. The first night it was kind of cold and I said would you like to run the heater and you said No. The next night you were taking a shower and I started the propane heater. When you got out of the shower you said “where did you get that?”. I said we’ve always had that. Boy was you glad that we had a heater. You thought that I was wanting to run the trailer heater that would drain the battery. We had a camp fire and we studied the sky at night watching for shooting stars and satellites. I would ask you what they were and you would have to think of what a shooting star was called or what a satellite was called. We would look at the flowers and robin redbreasts and the sage brush. I would test you each day as to what they were. At night we would watch TV. You liked watching Concerts that I had on DVD’s. You were intrigued with the way people played musical instruments. We went to wash the clothes at the laundry mat in Salida. You stood there staring at the washing machine after we had put our laundry in it. I ask you what was wrong, and you said I don’t remember how to put the money in and I had to show you. You said that you would be OK by yourself so I went to get water for our trailer. When I got back you were so excited and said “I was able to start the dryers because I watched how the other ladies put their money in them”. The world keeps swirling by and there is more of it that I want to see and do with you. You came in one Saturday morning in March 2007 and with a real cheerful voice and a big smile, you said “want some pancakes for breakfast?” You were reel happy to be able to do things for me. One Saturday we went to fort Stockton on our motorcycle and met Ishmael and Silvia Rangel. They were eating at the Mexican Food Restaurant. 3-25-07 our truck was parked in the church parking lot and Richard Siler came up to me and said “do you drive a chevy pickup with a camper shell?” I left with him, leaving you alone in the pew. After church services Glenna brought you out, you had been sitting there crying not knowing what was going on and it scared you. 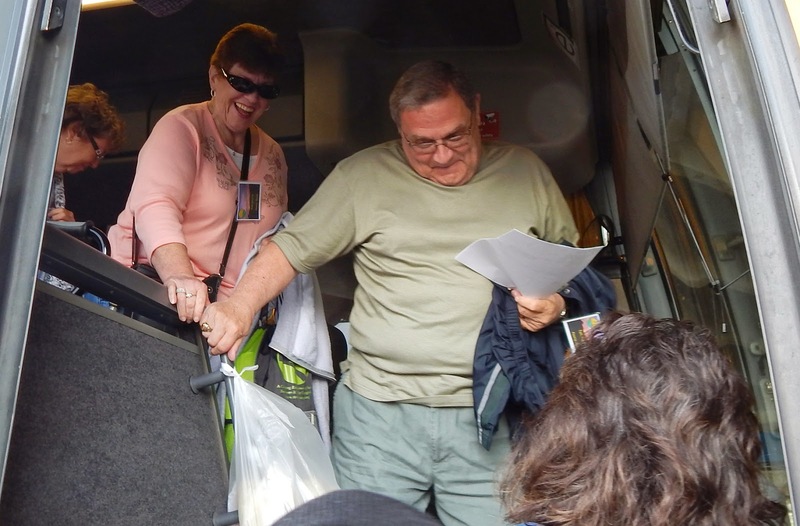 You met Steve in Colorado Springs at the flea market. He had a stroke about the same time you had yours. You and him starting writing letters to each other. You enjoy concerts and we try to go to them during the summer. Summer of 2007 You enjoyed going to my Odessa High School class of ’72 reunion you had a good time. While I was at work one day, you wanted to paint the house, so you got the paint and latter and got on the house to paint the eve over the porch. You got scared and couldn’t get down. Lupe saw you up there and rushed over and helped you get down. Please stay off the roof. You like going to flea markets. We went to the 2007 Air Show a jet flew over and made a loud noise and it scared you. You stood there and cried like a little child, I had to hug on you and tell you that it was OK and tell you isn’t it neat the way that jet can fly through the air. You stopped crying and we both started laughing. We went to Glenna’s to eat ice cream. You would visit with the ladies from church. You sharpened a pencil in the pencil sharpener 8-24-07 and said you new how to do that cause you had watched me sharpen one the day before. You said “that is a neat machine”. We went to Amarillo and watched a hockey game. We shopped route 66 shops. We got up to a blizzard the next morning and came home early. We’ll go back again sometime. We lost Snuggles our cat December 2007. We both are having trouble dealing with that. We seem to always find little things that remind us of her. She was a very special cat. She really started talking to us the last year that we had her. She was your buddy. One Saturday we got up late and I said would you like to go to the Carlsbad Caverns and you said sure. We went and had a good time. You were kind of nervous about going down the elevators but you did OK and had a lot of fun. You said they have new handrails. You were remembering when we had gone there years ago that in that particular area there use to not be any handrails. We went to see Leon Russell sing at the Hog Pit with Sharon Gene. Melissa went with us. You’ve had a hard time eating because you almost choked on a Doritos Chip. You have gone back to not eating well. For the next full year you had a very hard time trying to eat food and I thought I was going to have to put you in the hospital. One night around midnight you woke me up crying. You said you were hungry. You told me that you did not remember eating anything that day while I was working. I got up and fixed you a pimento cheese sandwich. I went in to the computer and typed you up a list of food items, so it would help you remember things we had in the cabinets and frig, that you could eat, while I was at work. I bought a little insulated soft lunch box for you and I would put snacks in it. That way you always had a snack handy to eat. I would look in it to make sure you had eaten something and you would have to tell me what you had eaten that day. Sunday 2-24-2008 We rode the cycle to Goldsmith and took the back roads and came out on highway 385 near the roadside park, then we came home. You enjoyed the ride. You know how to find the Little Dipper. You can’t wait till warm weather comes cause you like working out in the yard. You like to watch the movie Wild Hogs. You always laugh when you watch it. We went to Sweetwater, Texas to the Rattlesnake Roundup. We did not see the snakes, but we went to the Gun Show and Craft Show. We had sandwiches in the truck and then went to the flea market. We bought me some tools. We had seen a vendor that sold Cowboy Potatoes (potato chips) when we first started at the flea market and we said we would get something there on the way out. You couldn’t wait to leave so we could stop by and get some potato chips. They filled the plate about eight inches high. We put salt and a lot of ketchup on them and went to the truck to feast. You ate some of them on the way home and later that night when we got home. They were good!!! I run you out of the house so I could do our taxes. You were trying to be quiet but in doing so you were making all kinds of noise cleaning stuff. You stood in the bedroom trying to figure out how you would be quiet. You decided you would go to Walmart. I finished figuring our taxes and called Melissa to come over so I could figure hers. I had Melissa call you to ask where you were and let you know she was here. Michael and Kenneth came over we started a campfire and to cook hotdogs. Kenneth helped put the wood in the fire pit. He was having a lot of fun. Mom stopped by while we were getting the fire going. She ate with us. Later after you came to bed you said that you did not eat good today. So we got up and you was able to eat Pimento Cheese. That was one of your favorites. Easter Sunday: Raining outside. Everyone is coming over for hotdogs. It stopped raining and we were able to start a campfire and cook wieners. Mom brought potato salad and a ham. Bo & Jo, Amy, Mom & Dad, Melissa, Michael & Kenneth, and Randy came over. We ground up the rest of the ham and made ham salad. Mom & Dad loved it. You were able to eat it. We will carry some of that on our trip to Canton next week. You went to the rodeo with Melissa. You came in and asked me if it would be alright if you went to the rodeo. (I was still sick with tonsillitis.) You really wanted to go but you didn’t want to leave me at home by myself. I told you to go ahead and have fun. When you got home you were so excited and started telling me all about the cows and horses and how big they were. You had a good time. We went to Canton 1st Monday Trade Days. Then we pulled the trailer over to Shreveport, Louisiana and took a day trip to Vicksburg, Mississippi. In Vicksburg, we went through the Civil War Battle Grounds. You ask me why would people want to kill each other like that, weren’t they all Americans. We stopped at Traders Village on the way home and had to go to Cabela’s that was your favorite store. This is the last of what Charles wrote but certainly not the last of what they shared together and how they grew in the following years. It certainly is a testament of the love of a husband for his wife. The following article, 11 Habits of People With Concealed Depression, was written by Alexi Herrick and previously posted on the HUFFPOST Healthy Living web site, January 8, 2015. Lexi is a writer, marketing co-op and college student. She has other interesting things on her website at www.serendipityandcreativity.com. In Lexi's own words: "My name is Lexi and I am an aspiring marketing professional and writer. I’m a junior in college currently pursuing my bachelors degree in communications and also working in corporate marketing for a global technology company. In addition to that I am a contributing writer for a few different online publications including the Huffington Post and Elite Daily. At twenty years old, I seek to expand my abilities and completely immerse myself in the spectacular world of electronic media and marketing." 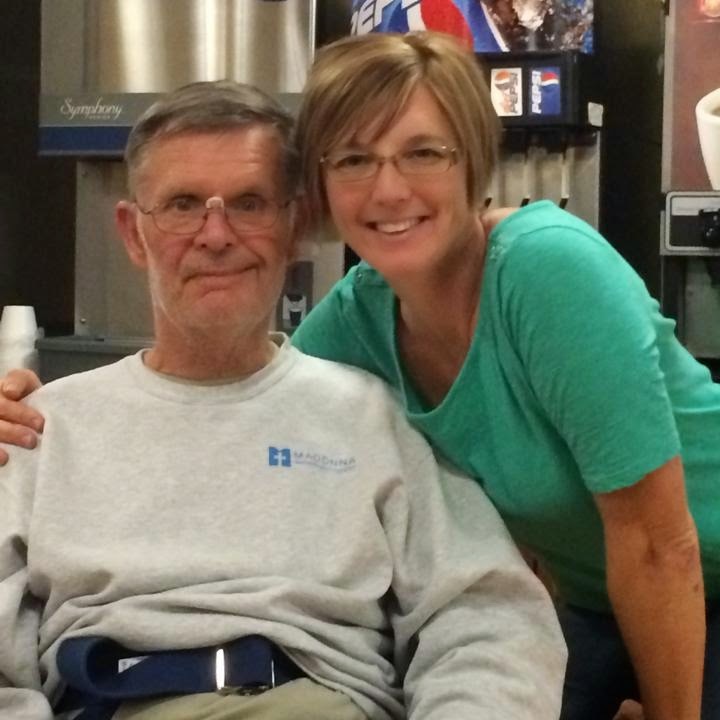 "Dad was unable to have surgery this morning due to a blood clot in his right leg (calf). The vascular surgeon was suspicious as he noticed swelling in his right calf so he ordered a Doppler ultrasound which diagnosed the DVT (blood clot) and he immediately canceled the surgery & started dad back on his blood thinner. Dad's aggressive outpatient therapy at Madonna is on hold now for 2 weeks due the risk of the clot dislodging and traveling to his lungs. He will follow up with the vascular surgeon in 6 weeks at which time a decision will be made to have the carotid surgery or not. Dad is very frustrated & discouraged of course but as I explained to him, it is a blessing the Dr found the blood clot as the alternative could have been much worse. God was watching over dad & the medical team today. Everything happens for a reason...every day is a gift. My family is so thankful for all the amazing care he received at Madonna the past 6 weeks as well. He will continue to improve...this is just a little bump in the road. Dad is looking forward to going home today to sleep in his own bed & hang out with his angel dog, Buddy! Thanks everyone for your continued support, encouraging words & prayers. God bless!" "Dad started the Madonna Rehab Day Program for OT & Speech this week. He's in better spirits the past couple days especially after receiving a call that he was able to get in to see a vascular surgeon at UNMC tomorrow for a second opinion on his carotid surgery. He has been very discouraged & impatient about having to wait a whole six weeks before maybe scheduling surgery again. He will do anything to have a chance at getting some movement back in his right arm but more importantly, the surgery could help prevent another stroke from happening. Keep the prayers coming. They are working!" "What a difference 9 weeks makes! Dad's stroke was already 9 weeks ago today & tomorrow he will take another big step on this journey...he will undergo surgery to place a stent in his left internal carotid artery to increase blood flow to the left side of his brain & help prevent another stroke. This is a video of him walking today in therapy. We are so thankful for how far he's come thanks to all the amazing clinicians at Madonna who have encouraged him to keep fighting & never quit. He will be in wonderful hands tomorrow at NMC as well. Thank you all for your ongoing support, love, and friendship. Please pray for my dad tomorrow. God bless!" 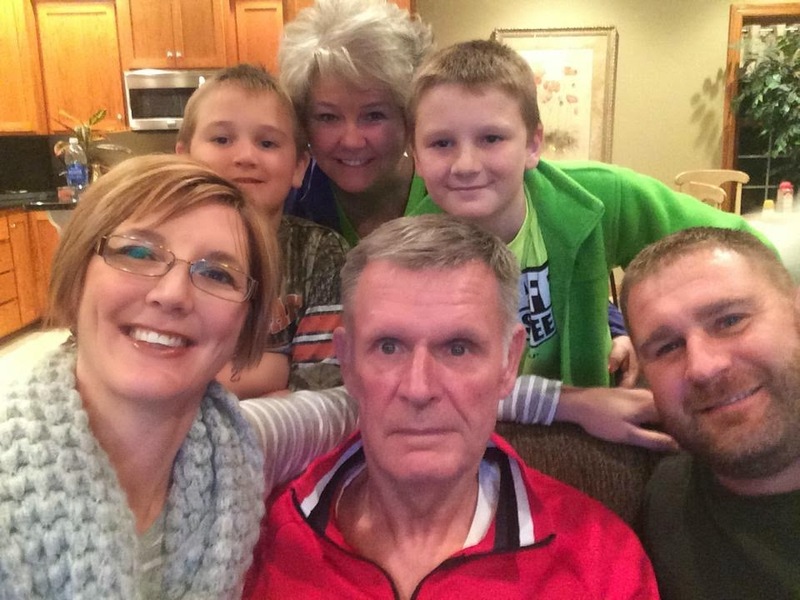 "Update on dad: He is out of surgery & in recovery. Dr. Longo, vascular surgeon met with my mom & I and said everything went well. He was able to successfully place the stent in the left internal carotid artery. 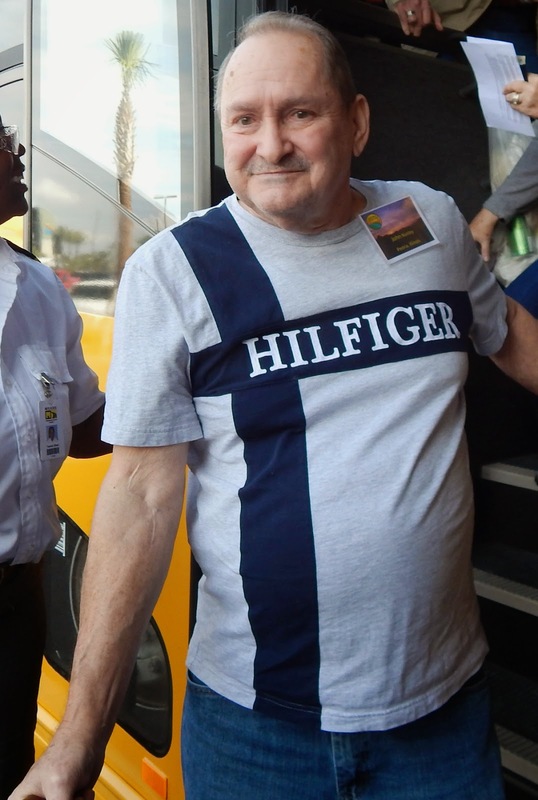 He did say the internal carotid artery was very "tight" meaning only a trickle of blood flow was getting through to the left side of his brain. He also explained that because the artery was so occluded (blocked) the tiny anterior branch off the internal carotid was having to provide blood flow to the entire front of his face & over the top & side of his head. It's a blessing he has the movement & sensation he does have on his right side of his body. The plan now is for him to spend at least one night in the neuro ICU at NMC so the doctors & nurses can closely monitor his blood pressure, blood flow to his brain & pressure in his brain. Dr. Longo explained when an artery like dad's has been so tightly occluded the sudden increase in blood flow to that entire left side of his brain can cause headaches & possible fluctuations in blood pressure so they want to keep a close eye on him at least overnight. He still needs our prayers. He has received awesome care thus far at NMC. Dr. Longo & Dr. Thorell are amazing. My family & I are so thankful & feel confident knowing he is in good hands. Thank you all for your love & support!" "Family selfie! Our family is especially thankful this year. Dad is home & doing well. Thank you to all our family & friends for your love & support. Happy Thanksgiving!" "Dad started back in the Rehab Day Program at Madonna this week. While the carotid surgery went very well last week he's continuing to struggle with worsening shoulder, hand & wrist pain in his right arm & this is very frustrating for him. It's so incredibly hard to see him in pain & to struggle to make the smallest movement in his arm or to find the word or phrase he's trying to say. No one said this was an easy journey. No one prepares you for this. The stroke affects the entire family. We all grieve the "loss" of some of dad's previous abilities & have to help him adjust to his "new normal." All we can do is continue to support one another & most importantly not let dad give up. Please keep the calls, emails, texts, visits, and prayers coming. Thank you all..."
We had a meeting today with his therapy team in the Rehab Day Program at Madonna. They were all very encouraging and complementary of dad's hard work & progress he's made. The plan is to transition from the Rehab Day Program around Jan 9th to the traditional outpatient program at Madonna a couple times each week in addition to doing his home exercise program and walking at home. He continues to work so incredibly hard and is so determined to keep getting better. 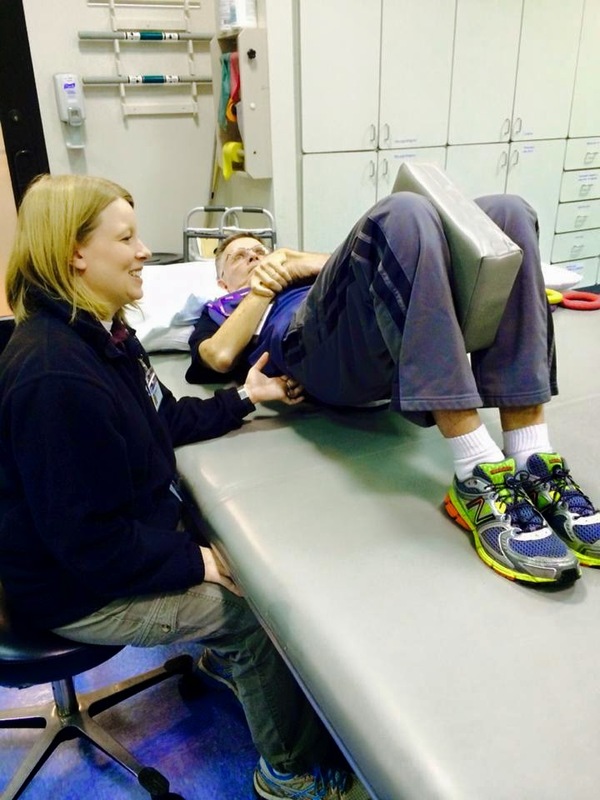 His right arm is slowly "waking up" but he is still unable to move his hand or fingers. Dad is walking better all the time. He did have one minor setback this week when he fell at home Wed morning and hit the back of his head on their tile floor. Thankfully everything checked out ok as we were very worried since he's on blood thinners and is more prone to a brain bleed if he hits his head too hard. My family & I thank God everyday that he is with us as we get ready to celebrate this holiday season. 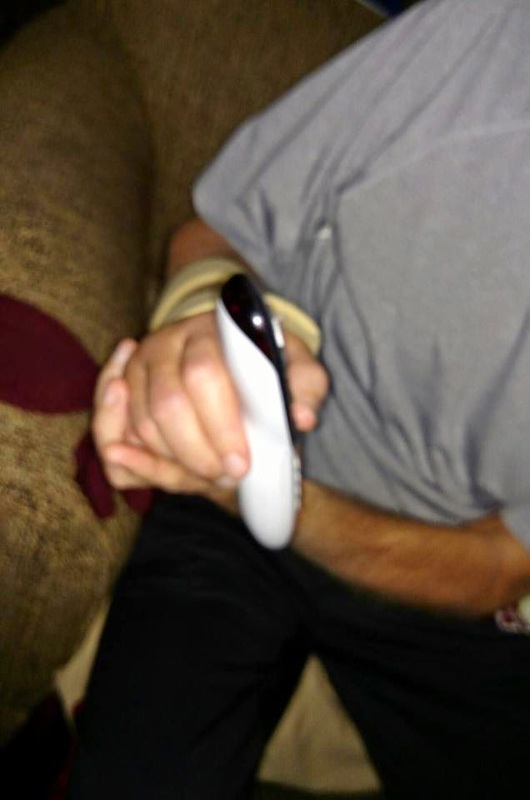 Please keep praying for continued progress and healing strength...."
"Just had to share....Dad was able to hold onto the TV remote last night while supporting his affected arm & wrist! Those of you who know him well know the TV remote is quite motivating! 😀 Its amazing how much concentration & work it takes to make such a small movement. It's so easy to take our own health & wellness for granted. I know Dad would say how important it is now to live every day to its fullest & celebrate the small successes with those you love. We are so proud of your determination & hard work Dad! Excited to see what the next few months have in store..."
"Dad continues his rehab journey at Madonna starting off strong so far in 2015. 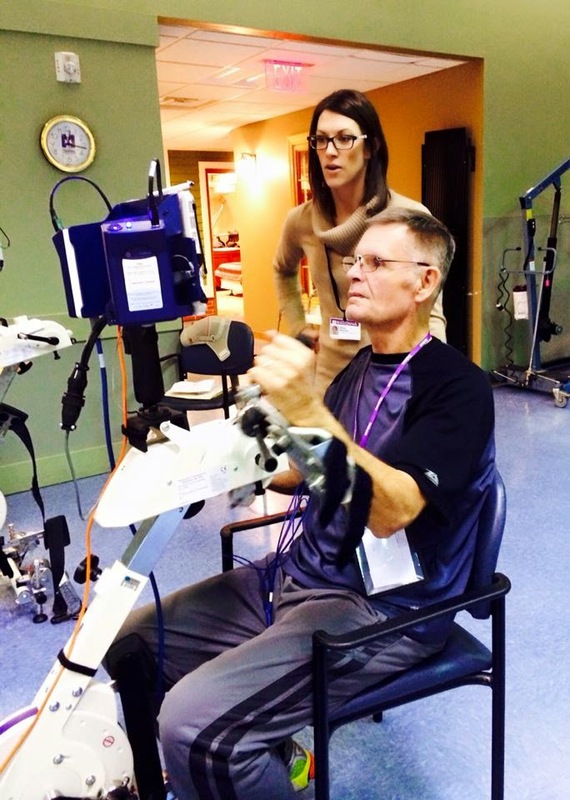 It's been a little over 3 months since his stroke and he is still making steady improvements, walking further with a cane, gaining strength in his right leg, and continuing to do daily exercises and electrical stimulation on his right arm and hand to try and facilitate motor recovery. He has even begun working on the driving simulator at Madonna hoping to return to driving this year. I admire his determination, hard work & courage. This is not an easy journey but he refuses to give up hope. We have so many of you to thank for your ongoing support, encouragement and prayers. 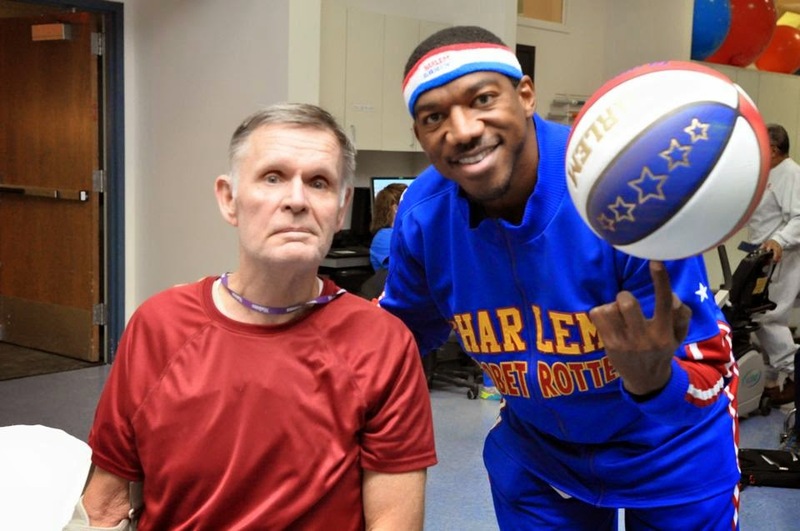 God bless you all..."
"Dad and several other patients got a surprise visit by one of the original Harlem Globetrotters, Buckets Blakes today during therapy." "After nearly 2 1/2 months in the Rehab Day Program at Madonna dad is taking the next step in this journey and will be transitioning to traditional outpatient rehab 2-3 days/week. He continues to amaze us by his strength, courage and determination to keep going even though the progress has slowed down somewhat. He is walking independently with a cane, is able to do all of his daily activities independently, has improved language and cognition along with increased strength and muscle activation in his right arm (2/5 strength with 5/5 "normal" strength). " "Mom has been his rock through all this, sticking by his side 8-9 hours each day in the Rehab Day Program and learning how to help him do the FES (functional electrical stimulation) bike to strengthen his right arm and leg. She even managed to get his insurance company to cover a very expensive electrical stimulation device (Bioness H200) he can use at home to continue to gain movement in his wrist and hand." 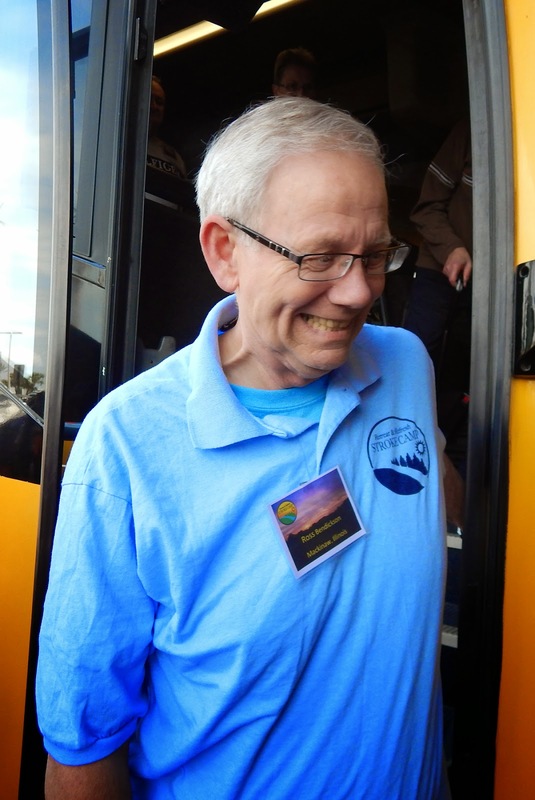 "Dad has also started working towards his goal of driving again thanks to the driving simulator and the driving retraining program at Madonna. Dad was a little emotional today as he said "goodbye" to his Rehab Day team...they have all done so much for him and we are so thankful. We also have SO many of our friends and family to thank for your continued prayers, support and encouragement. This journey has not been easy but with your love and support and our faith in God's plan for dad the future is bright! Love you dad!" No cane! I came out of my office this afternoon and saw dad walking without his cane! What a change from just over 4 months since his stroke. We are so proud of you dad and love you very much. You are such an inspiration to so many. As of this posting Bob has been back at home for a while. 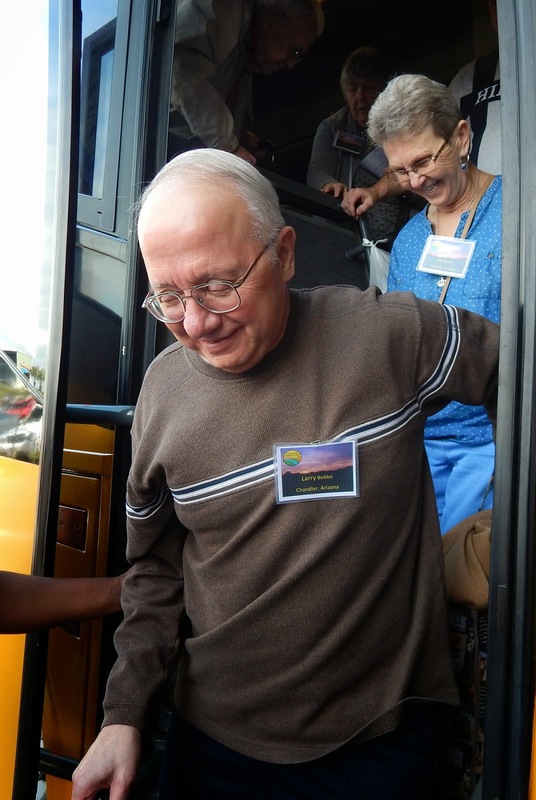 He is able to get around the house on his own, take care of his basic needs without assistance, able to prepare his own sandwiches and light meals and is currently training on a driving simulator with hopes of being able to drive again in the spring.